The Spiritual Ancestor Altar is your foundation and roots for a lot of spiritual work. This altar helps you connect with your ancestors and your spirit guides. Once you have created your altar it becomes like a magnet or antennae for other spirits to come to knowing that you work with spirits. Working with the spirits of your ancestors is very common practice in a lot of traditions. They are the closest spirits to you as they were family and they love you and want the best for you. They are also the Closest to the human realm and material world. 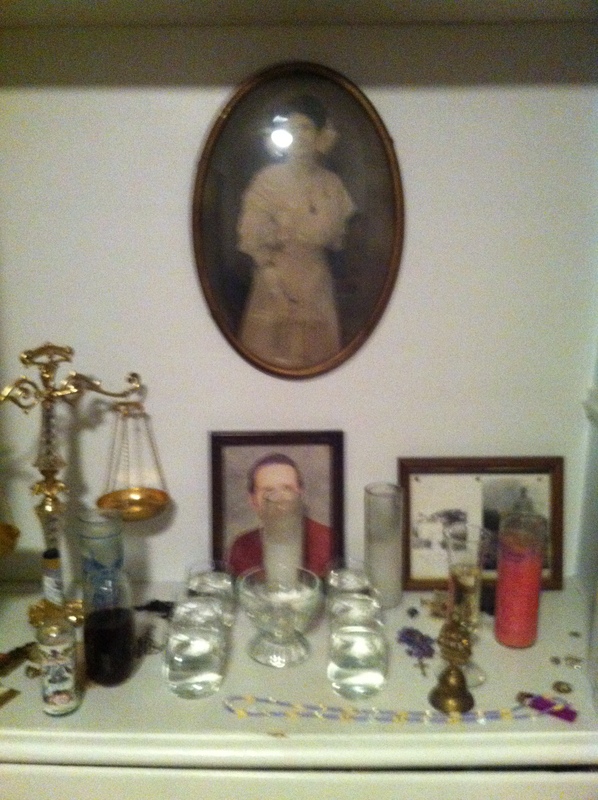 There are a few things to keep in mind when building an Ancestor Altar. The Best Place for an Ancestor Altar is the Living Room so they can be part of your everyday life. This is just a basic guide for what you can place on the altar but I feel that these things are the very basics that are needed. Every Monday Change out the water wash the vessels of water and replace the flowers. Each Monday also offer them some food when you make dinner a small plate is perfect. You can also offer them Coffee 2 cups 1 with a lot of sugar and one plain black. Any foods that they would have liked in real life are perfect as well as anything they drank. Typical offerings are Rum, Cigars and Cigarettes, candies, Beer, peanuts, etc. Take time everyday to speak to them Light a Candle for them to give them light. Pray for them for elevation and to strengthen your connection to them. Before you set up the actual altar it is a good idea to wash the area or table you are going to set up with a mixture of Florida Water, Rue, and white vinegar. Pray over the altar when you place everything on it bless them with the mixture as well if you wish to. You can get books as well for your prayers. The most popular that I tend to use is A COLLECTION OF PRAYERS. It carries prayers for your guardian angel, for lost souls, for help elevating your ancestors, for tortured souls, etc.